Yesterday afternoon during the opening of the GDC 2019, Google pulls out a new concept called Stadia. It combines services and infrastructures and puts them at the top of a gaming service. The power of remote hardware with super performance and the wide bandwidth of the next generation network to reach gamers anywhere in the world. Not really everywhere because you need a powerful network connection to the Internet with no lag and with small ping, but the power of Google could make the circle a square. Imagine the power of the XBox One X with the infinite catalog of games of the PlayStation 4 united with the portability and the fun of a Nintendo Switch. And mixing all with the fact that you don’t need to buy expensive new hardware console but just a cheap joypad. Isn’t a charming idea? The remote hardware will be all powered by AMD and it promises to be more powerful than any actual console, allowing you to play in 4K at 60 fps with the promise of a future amazing 8K resolution at 120 fps. If you don’t have a decent connection, the game will be scaled to 720p so you’re gaming experience can vary from an over XBox One X level to a Nintendo Switch level. Not bad, really not bad! Google, in addition, will have, for sure, AAA studios business on board and AAA titles at the new service launch date. We don’t know many things about Stavia, like the cost of the service, the minimum bandwidth requirements, the names of the Studio developing for it at the beginning and the scalability of the service. We don’t know if Stavia will be a service with longevity or another fault like Google+, but we know one thing for sure: with Stavia, AMD wins. At the GDC 2019 in San Francisco, Google executives said that the partnership with AMD will lead to thousands of exclusive custom AMD gaming chips in Alphabet data centers to run the Stadia service. 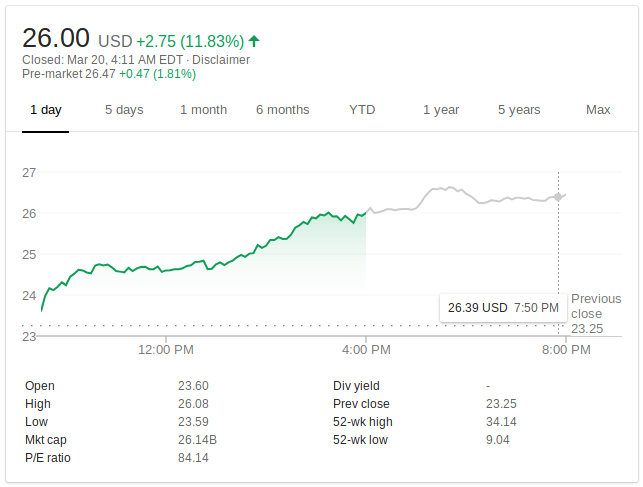 AMD stock spiked at +11.83% and after-hour and pre-market seem to be on the same line. What does it mean? It means that AMD puts its chips on all the gaming console and services except the Nintendo Switch that is powered by Nvidia. A contract for Alphabet and Google data centers is like a big win at the lottery for AMD, but what there will be over it? Google already use AMD server chips in data centers and Google partners (maybe Google itself will do it in future) also started to use AMD chips with low power consumption in Chromebooks, now Google is all-in on AMD for its gaming service and maybe it also plans to switch to AMD for machine learning products. So, if math is not an opinion, it would not be so risky for Google to buy AMD, would it?